Someone spoke those very words to me just yesterday. I stopped for a moment because there have been times, I’m sure, in all of our lives when we’ve said or thought similar things. Are you carrying a heavy load, yourself, right this minute? Do you feel like you have this large suitcase full of burdens that you carry around with you every where; “baggage,” if you will. It really is hard carrying all of that around. It weighs so heavily on our shoulders, and we just want relief. Someone, anyone, take this burden from me … relieve the burden on our hearts and minds. And I know just the One that will do this; JESUS CHRIST. If you pray and ask, God will reach down His Mighty Hand and calm the storms in your life. It may not be with immediate relief, but you will be strengthened while the storms in your life are weakening. He will make sure you are protected and safe, and He will lift the burdens you feel in your life. Yesterday on Facebook, I shared an article regarding depression. I shared this in hopes to bring awareness. There are a lot of people believing you can “choose” to be happy. I was one of them for a long time giving that message here on this very blog. When you are dealing with someone who has depression issues, though, it isn’t quite so simple. Unfortunately, I speak from experience having dealt with friends and family members with depression, and I have also battled depression several times throughout my 46 years. For me, depression is more “situational” than a disorder or anything more chronic. What I mean by that is if situations are seemingly out of my control and the situation seems to not have a resolution in sight, I tend to get depressed. Once the situation improves, so does my depression. The above list is times in my life when I have felt the situation was hopeless at that moment in time, and I was given anti-depressants to deal with some of it. I most definitely was given anti-depressants when I had the ruptured ectopic pregnancy because I lost my left tube when it ruptured resulting in half of my changes of becoming pregnant again being taken away. And, let’s not forget that although the doctor said it wasn’t a viable pregnancy since it was in my tube, I lost the baby my heart so desired! I cried for days and weeks, so the doctor prescribed medicine for me to help. The same thing happened when we lost my sister to suicide. Just recently, due to all of the trouble with the insurance company and the health issues I am having, I was prescribed anti-depressants Monday to help cope with the situation. I have yet to take them this time, though. It isn’t as easy as some people think to “get over” a situation that has really troubled your heart or a situation you feel you have no control over. Some people think if you just change your attitude or read a positive inspirational speaker’s book everything else will follow suit. Or, if you just exercise more or try to eat better, your life will turn back around due to your healthier lifestyle. If that was the case, there wouldn’t be a need for anti-depressants to even be on the market at all. People would be able to solve their own problems by lacing up their shoes to go for a run, as implied yesterday worked for the author. For me, I can pinpoint what lead to my situational depression. With all of the health issues going on, I was not able to sleep. Even when I tried, I was awaken by the issue letting itself be known once again by way of pain or bleeding. If you go a few days without sleep, it will really wear on you. The result for me is crying all over everyone after days of no sleep! When the pain is so great that you are forced awake and Tylenol won’t touch the pain you’re in, you begin to feel helpless, which leads to feeling extremely low and in a depressed state. Then top it all off with the insurance denials, it seems there will not be any end to your pain and suffering because no medicine they have given you will make it stop nor ease the pain. I’m sorry but exercising, reading an inspirational book, or trying to think positive does NOT help me when I’ve been in pain and haven’t slept. That’s just the facts! Now, after I have improved slightly this week, things don’t seem quite so bleak at the moment. I hesitated to even write that for fear the issues will rear their ugly heads even stronger than before. The purpose of this post is to just tell you to tread lightly with people who are struggling. Whether they have chronic depression or “situational” depression, do NOT tell them to “snap out of it”, “pull yourself up by your boot straps,” or anything of the sort. Instead, be compassionate! If you have never faced what the person is dealing with, consider yourself blessed. Being that you don’t know their pain, whether it’s physical, emotional, or mental, you have no right to stand in judgement or tell them how to feel better or handle the situation! They don’t need your advice, no matter how well-meaning it may be. What they need is your care, concern, love, and compassion. If you can’t extend those, then keep your mouth shut! Plain and simple. It hurts – depression truly does hurt. Be kinder than usual. You have no idea what kind of battle people are truly facing! Dirty Dancing has to be one of the best movies ever made. I’m not just saying that because of Patrick Swayze’s good looks and the way he could move. He was an outstanding actor, and he could also sing! My husband was surprised to learn that the voice on one of my favorite songs was none other than Patrick Swayze in “She’s Like The Wind.” This song was in the movie and part of the soundtrack for Dirty Dancing. A scene that stands out to me is the one where Johnny lifts Baby out of the water while they are practicing for their big, upcoming performance. There was such joy on Baby’s face when she stretched out her arms, tilted her head slightly, and pointed her toes as Johnny held her in the air during the lift. I have seen a similar smile form on the lips of my children as my husband lifted them numerous times over the years in play. I enjoy when the simplest of things sends the memories flooding into my mind. Just recently when we were playing in the pool, I encouraged my husband to lift my daughter like this once more. While one daughter, now 19 years old, seems to have lost interest in the pool, our other daughter loves swimming around like a mermaid. She is approaching 12 years old much too fast for our liking, and so we realize we must seize every single moment we can with her. We take whatever opportunity we can now to have fun, be silly, and just laugh together! We are making memories in the process that, we hope, she will hold on tight to for the rest of her life. Next weekend, we hope to tie the two together. There is a Dirty Dancing Festival being held in North Carolina at Lake Lure, where the movie was filmed! There, they will even have a lift in the lake competition! How fun is that?! While I doubt my husband and daughter will compete, it will be so much fun just to SEE! There has been mixed reviews on the festival, but I figure you can’t go wrong with the lake and the mountains as the backdrop. If, for some reason, the festival doesn’t hold our interest, I’m sure we can find fun nearby! Summer is winding down, schools will all be back in session, but we don’t want the fun and thrill to end. And … it doesn’t have to. We can carry the same feeling of joy in our hearts all year. Some times you may have to be intentional about it, especially when things come at you in life as they sometimes will. I can tell you this, though. You haven’t known true joy until you’ve invited Christ into your life. No matter what you’re facing, what you’ve gone through in the past, or what you feel like you’ve done that can’t possibly be forgiven. Christ will replace all of those feelings of worthlessness, if you only turn to Him. When you ask Jesus into your heart and turn from your sin, He will lift you up out of the pit of despair you’ve been living in. There will not be any more condemnation, as Christ will forgive you and restore you. The feelings of worthlessness will be replaced once you realize how worthy you are in Christ. He died on the cross to forgive you of your sins and give you the gift of eternal life through Him. Friend, won’t you turn to Him? Allow Him to lift you up out of the ashes so you can have the joy of the Lord shown on your face! 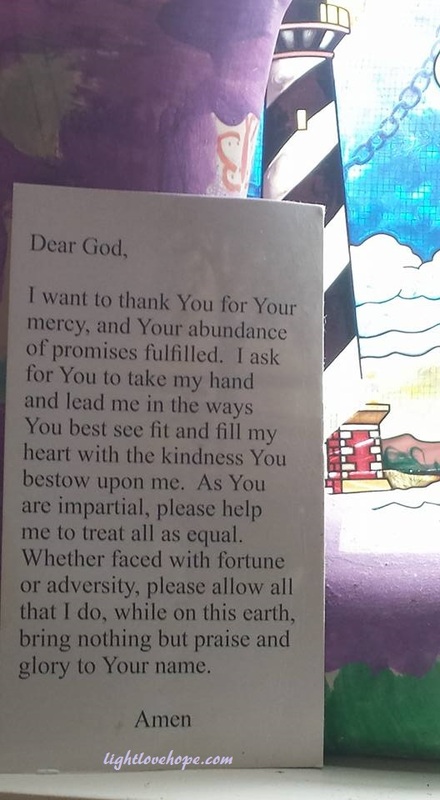 This little prayer sits in my kitchen window propped up against a stained glass lighthouse. Immediately to the right of the lighthouse are a few small plants that fit perfectly in that space. I purposely positioned them there to bring joy when I wash my hands at the kitchen sink. They are also there to greet me as I gaze out that window at the hummingbirds visiting my feeder. Tucked inside one of the green plants is a small mauve, white, and green hummingbird just in case I don’t see one fluttering around outside. While these things lining my window seal aren’t much, they bring a smile to my face and lighten my mood every time I see them. While I didn’t write this prayer, it spoke to my heart when I first read it. I’m actually not sure where it originated from, but for some reason I seem to recall it possibly being tucked in the St. Jude’s Children’s Hospital envelope. We try to donate to them every year. They are so kind to send little surprises such as address labels, note pads, and it just seems like it would “fit” that this little prayer was included. They also send personal stories of children that have been receiving treatment. Their stories break my heart as I recall a time when a sixth grade girl in my daughter’s class was diagnosed with cancer. My daughter was so overcome with sadness when she heard the news, and it was her heart’s desire to help her friend. We set out, along with Greg Johnson who handles all things behind the scenes with Light Love Hope, to do just that. Our efforts were successful and helped provide for her mother while she took off time from work to care for her child. Her story has a happy ending, as she just graduated from high school last weekend. Her treatment set her back a year on her school work, so she graduated a year behind my daughter. She has been in remission for several years now. This young lady is a walking miracle and a prime example of God’s healing power! Ah, but back to where this prayer possibly originated from. Perhaps it was included in literature that our neighbor, Ms. Betty, passed along to us. She likes to recycle things that she receives in the mail. Her heart is in the right place as she shares Journey magazines, calendars, and sometimes even books. The latest little booklets she placed in a yellow envelope inside my mailbox were about how to get to know Jesus. One book in particular asks on the cover, “Do You Know Jesus?” Yes! We do! No matter where this little prayer came from, it echoes my heart’s desire. How often do we stop to thank God for our many blessings? Oh, how wonderful it would be if we only stop for a moment, in between the muttering and complaining that we get in a habit of doing, and consider all that He has done for us. He has provided for our every need, and He will not fail. No matter what, God is an ever present force in our lives longing for a relationship with us. He cares for the tiniest sparrow. His love and care for us is even greater. Let every single thing that we say and do bring honor, praise, and glory to Jesus. May this be your heart’s desire as well. I chose those words because in life there are so many people just waiting to bring you down a notch or two. They can’t wait to intimidate you and try to make you feel like you don’t matter. There are others that take pride in trying to make others feel small and as if they aren’t enough. What I’d like you to realize is that the very people that are striving to pull you down and chip away at your self esteem, self confidence, and self worth are the very ones that are struggling themselves! Otherwise, why would they attack another human being? They wouldn’t! If they were happy in their lives, they would be basking in the sunlight, smiling at their beautiful lives instead of plotting evilness and spewing hatefulness. They are miserable people that do not like to see others succeed. They want to grab a hold of you and bring you down into the pit of despair that they are living in. Honestly. Think about it. Why else would these people do it? From social media shaming, bullying, to “indirecting” someone in a way that others that are familiar with the situation will know who you’re talking about. It’s petty and makes the person doing it look extremely small. Sadly, this happened at the beginning of the year to my daughter. All she wanted was to be left alone, but the more she tried to get away from the offenders, the harder they tried. I like to believe that there is good in every one. As humans, and yes as sinners, we have the bad that wants to come out at times. But that is when we truly need God. We don’t have to let the “little man” get up on our shoulder; ie: the devil. We don’t have to fall victim to his schemes and do evil things to others around us. We can resist, and we should. Often times, though, certain people choose not to and that is where trouble comes in. People want a sense of community and a sense of belonging. They need companionship. We actually crave it. However, in light of how we’ve been treated in the past, we resort to just keeping with our family unit and not allowing very many people in. Just when we “think” we can find happiness by being involved in a group, we soon learn that not all in the group are welcoming. This happened to me yet again with a group in my town. We were bound together due to our love of horses and trail riding. We were to go on trail rides together, and I did attempt this with them twice. It resulted in me being left behind. One time it was clearly because I was on an extremely lazy horse that didn’t want to speed up. She was perfectly content to take a slow and steady pace along the trails. I can understand where this might be frustrating to others on faster horses. That being the case on this first trail ride I went on with them, I did not get offended by them going ahead. The only thing that concerned me was that I was not in a familiar area at all. I did not know my way around, and I was afraid of getting lost. The second time I attempted a ride with the group, I was on my much faster horse. The result was that while my horse kept up pretty good with theirs, at one point they wanted to run their horses. I did not want to run mine, so I stayed back. I assumed (which was wrong of me) that they would run for a bit, then wait for me to catch up. That did not happen. Instead, they rode on without me. I decided at that point in time that I would not ride with them again. This was twice now that I “thought” I was included only to find out that I really and truly wasn’t. I’m sure there will be those that will say that it was my fault because I didn’t join them in running my horse. I have a hip injury that prevents me from doing much that involves being jolted around whether it’s trotting or loping/cantering a horse. I have done it since my accident two years ago, but I prefer a nice, safe walk. We have ridden with a man and his wife that actually waited up on me before despite what the rest of the group was doing. It did strike me that he was the ONLY one to wait around on us, too. But he said out of common courtesy, that is what you do! Obviously, the rest of the group didn’t get the memo on that! Still … trying to give people the benefit of the doubt … these same people saw my posts on Facebook about the different places we would ride, and they said, “Hey, let us know where you’re riding next, and we’ll join you.” I did just what they said, and I let them know where we were riding. I even created an “event” on Facebook for it … and guess what? No one showed up. Not a single person. So, I won’t be inviting them on any future rides. It’s not like they would come any way! And posting in a “group” with them? Yea, the majority of the time what I wrote would be ignored. I know that you can’t take everything so personal. I get that, and for the most part, I don’t. But when you want so badly to be a part of something and this happens … again, and again, and again … it is disheartening. For me, I’d love to be included and to feel like I’m a part of something. This is where everything shifts for me because I AM a part of God’s kingdom! He loves me and wants a relationship with me. He welcomes me with open arms and forgives me of my sins. He wants to hear from me, to hear my prayers and He waits for me to engage Him each and every day. He won’t ignore me. He won’t turn me away or leave me. He will always be with me and for me. This is where you have to turn the focus off of the approval you wish you could get from your fellow man … and focus on GOD! You are HIS child, and HE loves you more than you will ever know. If you’ve been feeling like you don’t matter … aren’t enough … aren’t included … or are often times ignored … know that the devil wants you to feel these things and have a low opinion of yourself. He wants you to be down in the dumps, to be consumed by depression, and he uses others to get to you in this way. Will you shift your focus on to GOD, instead? Will you focus on the truth in the Bible and stand on God’s promises? It matters not whether people include you here on Earth, as long as you are included in the Lamb’s Book of Life in Heaven! I know it hurts your feelings. Believe me, I know all about it. But rise above it like I have. Those people that try to make you feel small DO … NOT … MATTER. In the grand scheme of things, they don’t. Not to your self worth. Not to your self esteem. Not to your self confidence. Whether they acknowledge you or not. YOU MATTER … YOU ARE ENOUGH! And at the end of your life, that is all that will truly matter as God ushers you into the gates of Heaven and welcomes you home. Recently, you may have encountered more horse pictures on your Facebook timeline than you normally see. That is due to the horse community uniting after several tragic losses. 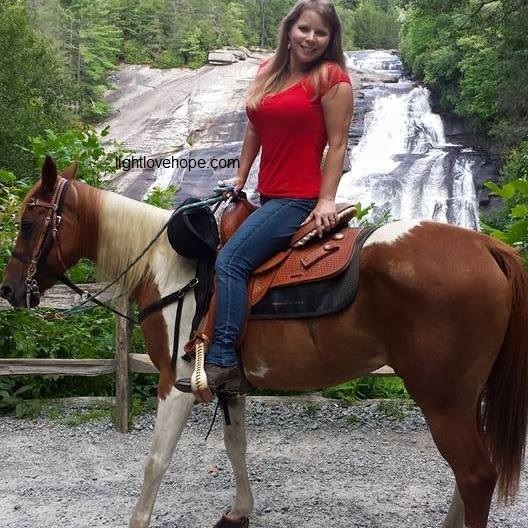 Right before that, Lara Deweese, a well known professional barrel racer, was killed while participating in the sport she loved with all of her heart. (Read more here on Lara’s success in barrel racing and her tragic death.) This really frightened me as I have friends that compete in barrel racing events. The horses are, of course, traveling at an extremely high rate of speed to make the best time for the event. My youngest daughter has expressed an interest in both jumping, like Olivia, and barrel racing, like Lara, but I have not been able to push my fears aside to get her involved in these events. Instead, our time on the back of our horses is spent strictly for pleasure as we enjoy each other’s company under the vast sky riding through God’s beautiful countryside. I do realize that horses are spooky by nature and typically have a flight response when startled so there is a risk even in trail riding. That is why I’m posting this today. The English riders typically are the only ones that wear helmets, yet I encourage everyone to wear protective helmets no matter if they are taking a leisurely stroll through a familiar forest or if they’re participating in events. Western riders typically do not wear helmets, and we have gotten teased by some of our friends when they’ve seen us out riding with our helmets on. I’ll admit that I do not always wear my helmet, and I often times slip my helmet off for pictures because it is hard to tell who is under the helmet and sunglasses if I don’t. Plus, I like having pictures to look back on, and who doesn’t want to look good on the back of a horse?! But, safety is paramount! For us, even if the adults in our party elect not to wear their helmet on an outing, any one under the age of 18 is required to wear one when they’re with us. We will not make any exceptions to this rule. I realize that the issue with Olivia’s accident wasn’t whether she was wearing a helmet or not. I imagine in the event she was participating in, it was a requirement. She lost her life when the horse landed on her, from what I’ve read. It is so very tragic! In the case of Lara, though, from what I have seen and have been told about the sport, barrel racers do not wear helmets. Lara’s horse slipped around a barrel, recovered, and then bolted with her on the back unable to regain control of the horse after the reins went over the horse’s head. I can only imagine the horror both of these young ladies, their families, friends, and spectators felt witnessing or learning of these accidents. With horses, we go into the sport understanding that there is always a chance there of something happening. We pray that it won’t, but … we aren’t always as fortunate when we climb up on the back of these beautiful creatures. I know firsthand, as I had a horse bolt on me. In my case, I was lucky that my head did not strike the ground, although I still sustained a concussion from the impact of being shaken around when the horse bolted as well as when my left hip struck the ground. As much as everyone says that you can stop a horse with the one rein stop (pulling the horse’s head around to the side with one hand), nothing was stopping the pony I was on that day from bolting and bucking. I, too, lost the reins at one point, and I was holding on for dear life until I got thrown off. I was lucky to literally be able to walk away from this accident as later it was discovered at the emergency room that I had a fractured hip and fractured hand. Even still, I knew that if I didn’t get back on a horse when I did, I never would. So, two months after my accident, filled with anxiety, complete with sweaty palms and racing heart, I got up the confidence to climb back on one of our well trained and calm horses. 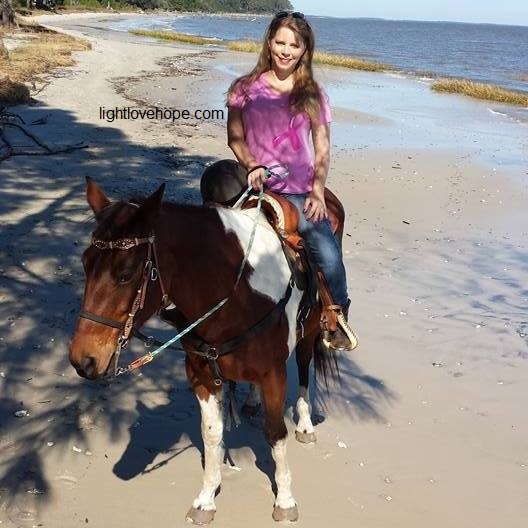 That’s all I wanted to do was sit there in the saddle to prove that I could overcome my fear … and I did! The feeling, love, and passion for the horses and the sport, the desire to still be an equestrian after the accident was there so strong. I am proud to be a part of the horse community, and I am uniting with equestrians around the world to share my pictures and story in honor of Olivia, Lara, and all other equestrians who have lost their lives or have been injured pursuing their dreams on the back of a horse. Please pray for the families and friends left behind, for all that are looking to get into the sport, and for all who enjoy the thrill of the ride and getting back in the saddle as often as possible. 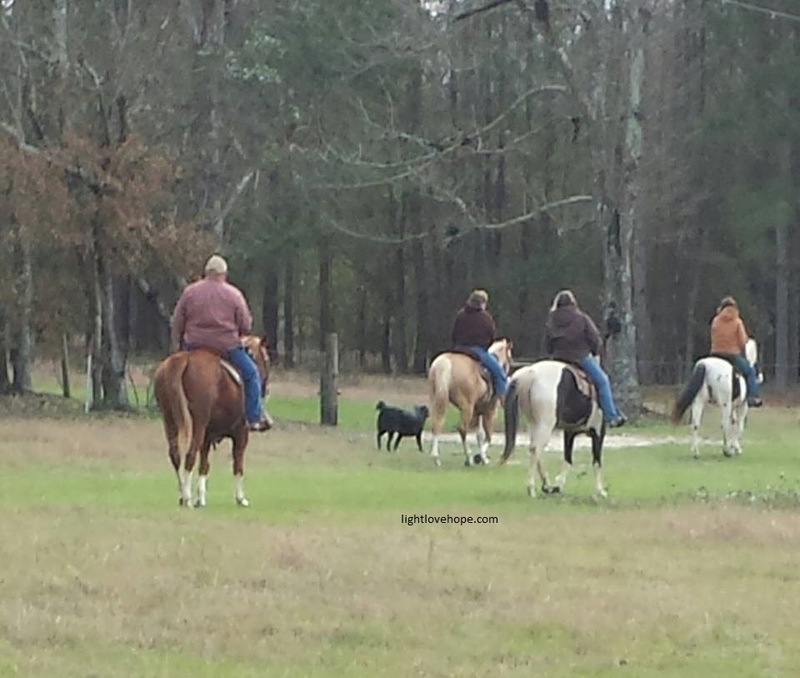 We loaded up the horse trailer and headed out this afternoon for a much anticipated trail ride with old and new friends. As we pulled out of our driveway, we were looking forward to a great day before us. My 11 year old daughter accompanies us on trail rides the majority of the time. She is usually the only child in the group, but that does not seem to concern her much at all. Occasionally, she has encountered situations where she felt threatened with inconsiderate riders racing past her, but we knew that would not be the case today. The group we were riding with has respect for other riders and would not put someone, especially a child, in harm’s way. Leaving the paved road and turning onto the dirt road, we looked for landmarks to tell us where to turn to reach our destination. It wasn’t long before we rounded the curve to see multi colored horse trailers on the hill. We smiled knowing that today was going to be a GREAT day! As soon as I got out of the Suburban, one of my old high school friends came around the back of our horse trailer to give me a hug. We have been trying for a good six months to ride together, and finally, our schedules allowed it! Today was the day! Shortly thereafter, another lady, that I’ve known for years that is now well into her 70s and still riding, approached us to say hello. She was all smiles, and I wondered if she realized how much of an inspiration she truly is. A breast cancer survivor, she seems to always have a smile on her face and a positive attitude – yes, even when she was going through treatment. After introductions were made with the rest of the group and fond hellos exchanged with our farrier and his wife, who were invited by us, we all secured our saddles and got on our horses. Making our way down the grassy section and then on to the dusty trail, I began snapping pictures to mark this occasion. There was a total of nine riders today, although not all are pictured here. 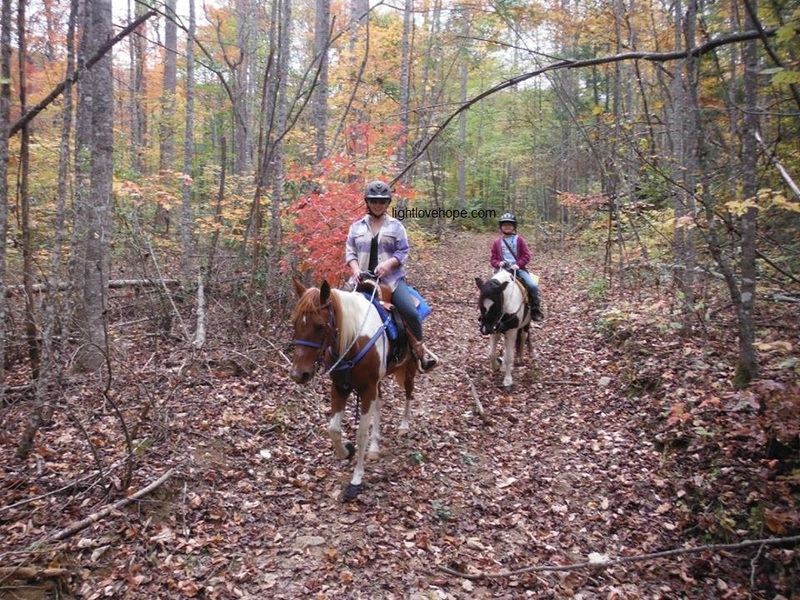 Our horses all did great through the trails that were weaving in and out of the wooded area that eventually opened up into a huge pasture and then finally onto long dirt roads deep in the country. 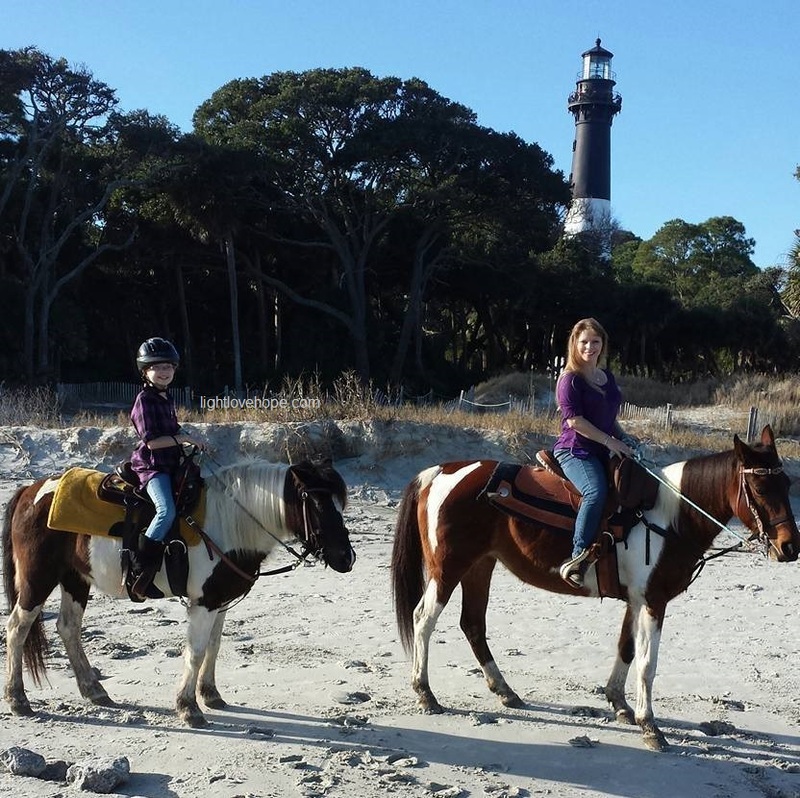 Ah, my favorite place to be; on horseback with my family and great friends! It was at that moment I realized that when things don’t go as planned, we simply cannot give up, resolve into tears, and leave our pony right there in the middle of the road. Instead, we must think of a Plan B or another way of accomplishing what we’re looking to achieve. 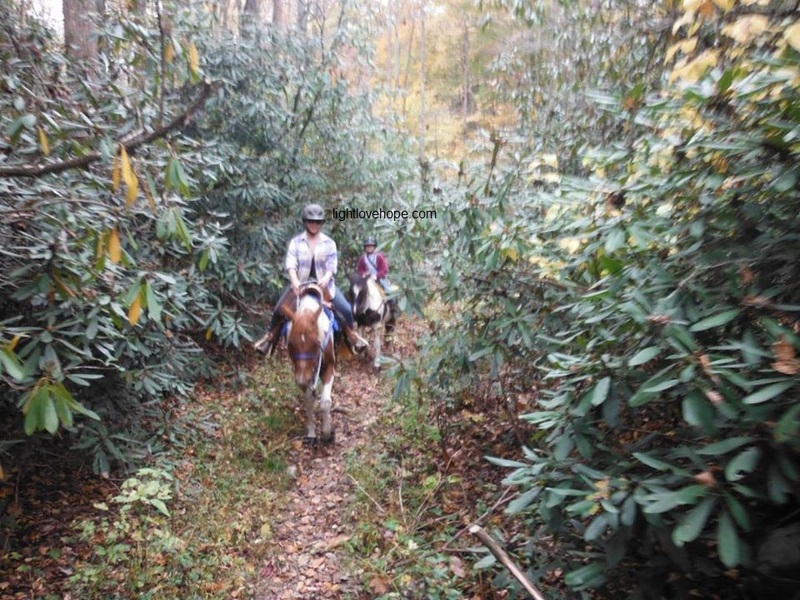 We set out to have a wonderful trail ride with friends, and it is normally relaxing. It is as if we can feel the stress melting away as we walk along on our furry companions. This was a minor setback, and it did not last a long period of time; however, when you’re “in the moment,” it feels like minutes have turned into hours of torture! Feeling determined, though, I was willing to do whatever it took to ensure that the day was not ruined and my daughter’s tears would fade away with smiles and laughter taking their place. 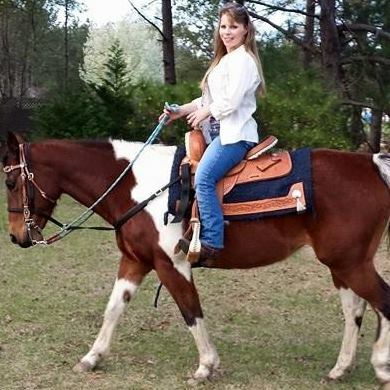 I dismounted from my gentle giant, and I offered my paint horse to my daughter. My horse is very laid back, and if she has any faults at all, it is that she is extremely s-l-o-w at times. 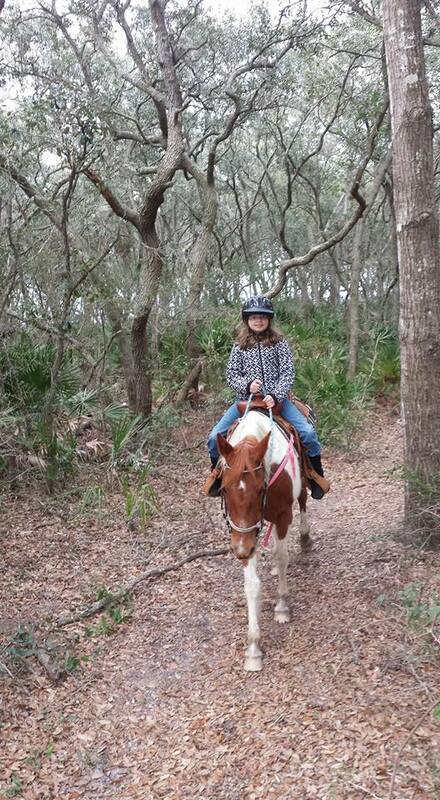 I knew that a slower horse would be better for my daughter at that point in time instead of a stubborn pony. And so, I offered my horse to her, and she accepted it. Having not ridden her pony but one time around the house, I was a little apprehensive. I knew that if the pony took good care of my daughter and did not put her in harm’s way, she would surely take care of me. The thing with ponies, any horse person will tell you, is that they are stubborn through and through at times. At other times, they are good as gold! Tightening the girth, I slid my left boot into the stirrup and lifted myself over the pony and softly into the saddle. Once my right foot was secure in the stirrup, we started to walk slowly ahead. It wasn’t long before the pony tired to be stubborn with me. I gave her the reins so I knew I wasn’t pulling in her mouth with the bit, and I urged her to go forward. When she would resist and try to turn the opposite direction of where I wanted her to go, I started making her go into circles. If she wasn’t going to do as I asked her, she was going to be made to work in tight circles. Finally, she decided to comply. We walked on for a good bit, even trotting to relieve her boredom, but sure enough, she tried me once more. When she did, I insisted that she back up, and I kept insisting until I was confident enough at this point that she would walk on with no problem when I asked her to do so. Sure enough, she did, and the remainder of the ride was beautiful! We trotted, we laughed, took pictures, joked, and even started singing silly songs along the path. The day wasn’t ruined after all by a stubborn little pony! When things are not going your way, don’t go as planned, or someone tries to drag you into drama or spew negativity at you, don’t give up, give in, or get angry. Instead, try another approach. Some times, that is all it takes to continue marching on to happier times, even if you have to switch things up for a little while. Hold your head up high, and remain confident as you walk through any unpleasant situation. Rest assured that it will not last long. It is just a temporary set back, and before you know it, you will be back smiling, laughing, and enjoying life again. 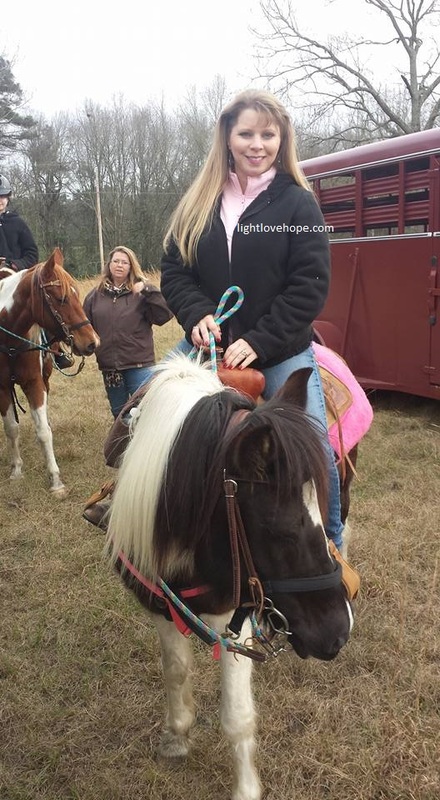 After we switched horses … Look at that SMILE! 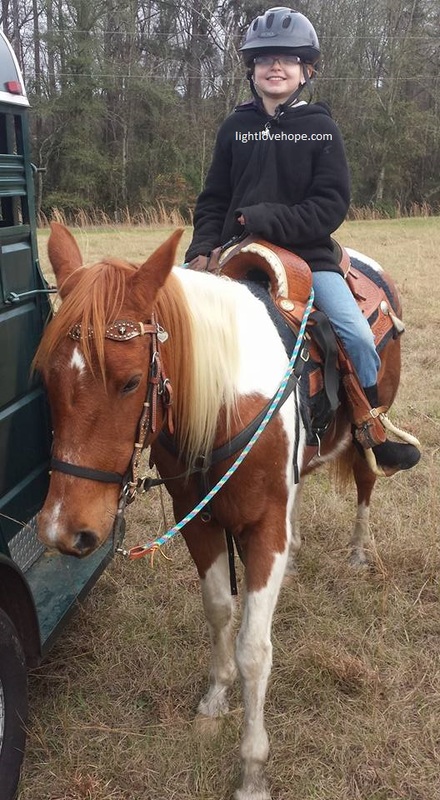 My daughter’s Pinto pony was a good ride, even if our friends joked that my horse shrunk along the way. lol You do what you have to do at times. It’s nice to always have a Plan B. Yesterday on Twitter, I was invited to participate in a link up. (Thank you Hope N. Griffin!) I was extremely excited and flattered that I received this personal invitation. The topic everyone was to write on was how you’re finding joy in every day. She posed a few questions, then reminded us that Advent is about peace and resting in the joy of the Lord. 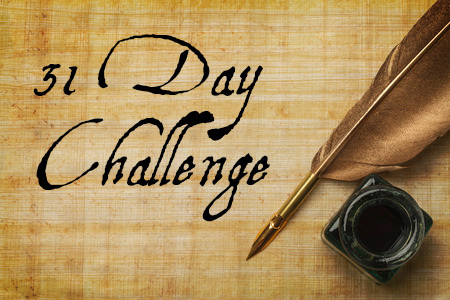 I took some time to ponder on what she wrote in an effort to get my creative juices flowing. I seem to be lacking in that department these days, and it has dawned on me that it is because I am not feeling peaceful in my soul. I’ve lost my joy in the past few days. If I am completely honest, the troubling blue funk was attempting to take me down this past weekend, immediately after Thanksgiving. 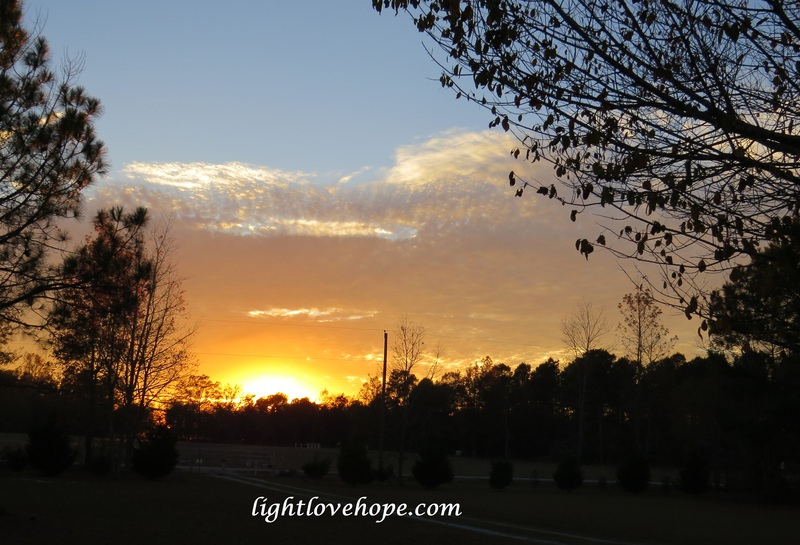 We have so much to be thankful for, as I covered in a post just last week. So why the blue funk? Everyone is busy with their Christmas shopping now that this special holiday is upon us. But, that isn’t what is troubling me. You see, my sister’s birthday is December 13th. It should be a time of sweet celebration, yet … this time is filled with sadness as she has been gone 14 years now. And what’s more, just when I think I’ve overcome the struggle to get through the holidays without this bothering me … I realize that it has all but consumed me. I’ve been on edge due to this being in the back of my mind. I’ve been short, snapping at my loved ones, or irritable for no reason, or so I thought. Other times, I’m extremely quiet and withdrawn. 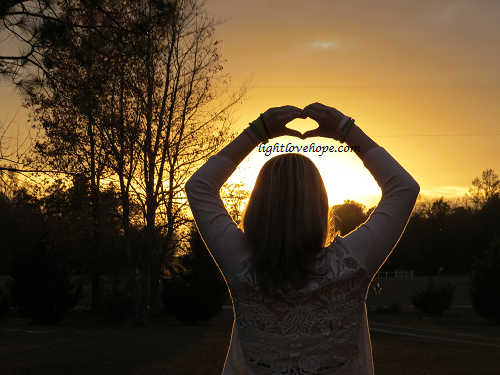 Then it hit me today as I was thinking of what Hope asked on her blog. Every year, on the first Saturday in December, we attend The Angel of Hope Ceremony. Here, gathered with others who have lost loved ones, we honor their memory. We have been doing this for several years now, and this year will be no different. My sister’s plaque is on the wall at The Angel of Hope Monument in our town. 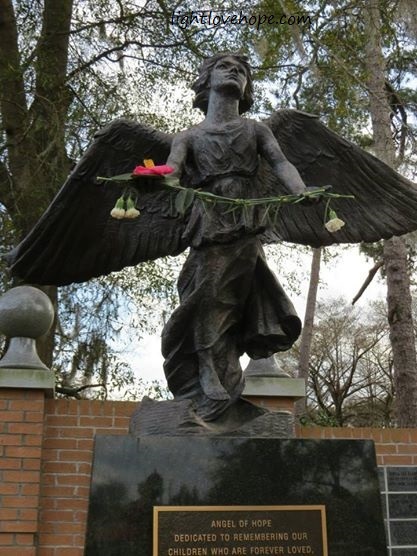 It is hard to visit the cemetery at times, so here, we find some comfort standing beneath the large angel statue in the garden. Even if it is just a piece of stone with my sister’s name itched into it, it is there as a reminder that she lived, loved, and touched a part of our hearts. Her memory will live on forever. So how will I get my joy back at this time? The same question can be asked for people every where that are struggling at this time, as I know I am not the only one having trouble during the holiday season. There is a young man, close to our family, that is struggling after losing his granddaddy a few short months ago. His pain is still fresh and new, as I believe this is the first holiday season they have had without this very special member of their family. There are others that have lost valued friends, and they are trying to cope as well. I know another gentleman that lost his mother and sister, so I imagine his pain is great during this holiday season, although he won’t mention it. A lot of people internalize their pain, holding it close to them, while others are afraid to acknowledge it for fear of it hurting more if they do. Others will eventually speak about their loss, but the majority of the time, people will suffer in silence and try to deal with their pain alone. For me, I am choosing to reflect on the good times and the wonderful memories I have of my sister. To take back my joy and push this blue funk cloud right on out of here, I am choosing to reminisce about the time I took my sister to Folly Beach. She wasn’t one to frequent beaches, as her milky white skin reflected. On the off chance that she would, she returned looking like a lobster. Yet, on this particular day, she wanted to go with me to the beach, and so I took her to one of my favorite beaches of all time. There, I watched my sister smile, deep from her soul, as she jumped the waves that were crashing in. I can still see her standing with her back against the waves, feeling self conscious at first, allowing them to move her slightly forward as she resisted against their strength. Finally, she gave in and allowed the child within to play, jumping each wave as they rushed in. Now, each time that I’m tempted to focus on her absence, I will, instead, try really hard to focus my attention on fond memories I hold close to my heart of her. I encourage anyone else who is struggling to find joy this holiday season to do the same. Your loved one would not want you sitting around crying over them. Instead, they would want you out and about enjoying the sights and sounds of the holiday season. So, go. Get out of that chair, leave the gloomy room in your house where you sit and overthink things, analyzing it until you feel worse … and focus on having fun in their honor. Talk to them along the way, or even comment in the presence of others what your loved one would have enjoyed about the activity that you’re sharing with them. Or do something to celebrate their life. Don’t focus on how they died (which is really hard in my case, since my sister committed suicide). Instead, focus on how they LIVED! 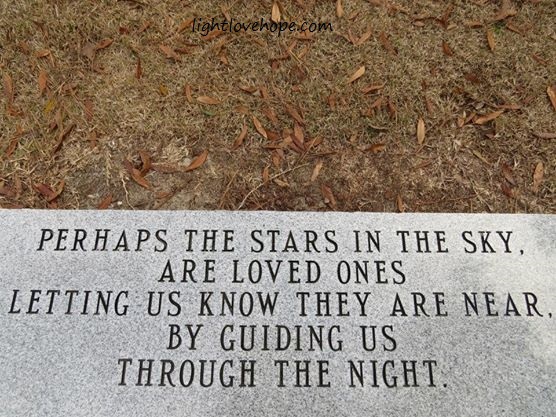 To those missing loved ones this holiday season, I’m right there with you. But, we have to turn this sad sack train around and jump on the Polar Express to happier times, even if that is by taking a stroll down memory lane each time our thoughts derail. Thank you, Hope, for inviting me to join in. While I’m almost certain this isn’t what you had in mind when you invited me, thank you for allowing me to write what has been troubling my heart. Now that I have acknowledged it and shifted my focus, I will pray for God’s peace and joy as we prepare to celebrate the birth of Jesus Christ in just a few weeks. Have you ever really thought about it? What brings you joy? I’m talking joy deep down within your heart and soul. The smiling all day long type of joy. The skipping down the sidewalk with a cheesy grin on your face joy. The humming a tune as you go about your day whether you’re at work or at play, just humming along or whistling to that tune that is stuck in your head. Your feel good, happy dance, basking in the memories joy. There are several things that come to mind for me. Receiving flowers picked fresh from my yard from my baby girl brings extreme joy down deep within my heart and soul. Whether it’s roses that she picks from my rose bushes or even just yellow dandelion yard flowers that pop up in the grass that she gives to me. Each and every flower is precious and thrills me completely. Just last night as I was riding my horse, Sugar, my daughter came bouncing down the driveway straight toward me with our two goats hot on her heels. 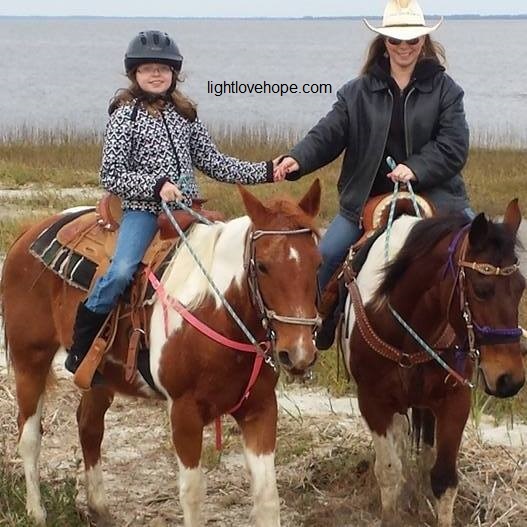 As she reached my horse and I, she smiled widely and said, “Close your eyes, Mama,” as she took two fingers and swiped in the air in a downward motion. I could feel a little grin forming on my lips as I did as she asked. 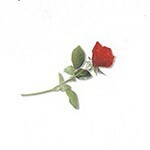 When I opened my eyes upon her prompting, I saw a pretty mini rose that she picked just for me. I thanked her and told her how special that was to me, and then I tucked the rose in a loop on my saddle where it stayed secure the rest of the ride. She bounced around the yard, skipping and smiling, as she played with such delight. I smiled deep within my soul. Another thing that brings great joy is seeing my 18 year old daughter enjoying her new job at the bank. She’s held jobs before, but they’ve been at different fast food restaurants in town where she was on her feet all the time. She had to deal with harsh customers at times, clean up duty, and working long hours for little pay. Now, though, she’s working a job where she exclaimed with excitement after her first day, “I get to sit down now, Mama … the whole day!” It’s the little things that mean so much. Never before has she appreciated being able to sit, until she worked three part time jobs where sitting was not an option unless on a quick break. I have joy in my heart as I watch her go through my closet and pick out clothes to wear to work. Clothes that she once wouldn’t be caught dead in, and now, she realizes the value of these clothes as they are appropriate for a business setting. She has even received compliments on her attire from coworkers at the bank. She says she smiles and tells them that they are her mother’s clothes. Then she adds, “Do you REALLY think I’d buy stuff like this? Pul-lease …” and she laughs as she throws her head back. Ah, but while she jokes, I know she really doesn’t find them unflattering or undesirable, as she is back every morning to “steal” more clothes from my closet to wear to work. Early mornings are filled with joy as God wakes me with sunlight streaming through my window. I am thankful for the gift of another day with my family. As I hear my husband in the bathroom getting ready to greet the day, I smile inside as I’m ever so thankful that he’s here, a part of my life, and that I get the privilege of being his wife. Just as I snuggle back into the sheets and pull the plush comforter over my shoulder, he comes out of the bathroom and slides his hand into mine. I begin to stir and reach for his arm to pull him closer to me to give him a kiss and hug before he leaves for work. And I smile, deep within my heart, as there is sweet joy to carry me the rest of the day until we see each other again after the work day is through. Then there’s my parents … watching them interact together after 49 years of marriage. Yes, they have their moments as all couples do, but they get past them. They work it out, and they move on to happier times. They are still making memories together, and I am thankful that I have the honor of being their daughter and a witness to their love and life together. I’m filled with joy when I see my daughters interacting with their grandparents, running into their arms when they see them whether it’s been a few weeks or a few days, the greeting is the same. And last, but not least, among the things that come fresh to my mind that bring me joy … my animals. Ah, first I have to mention the goat baby, as I call her, that we brought home at just two weeks old and had to keep in a crate in the house due to the cold weather. We bottle fed this little baby every four hours for weeks, changed the crate, took it outside to play, and loved on this little girl every chance we got. Because of how we handled her, she has no idea that she is even a goat right now. 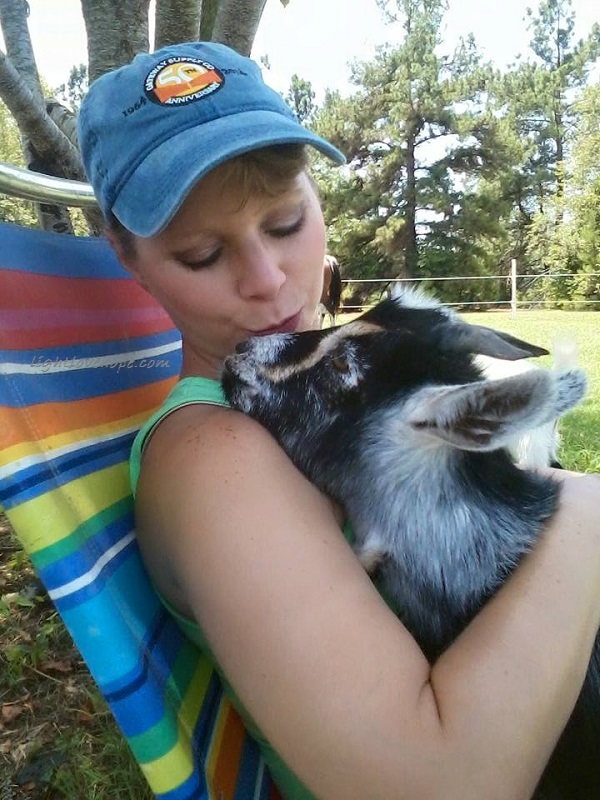 As she’s grown, we had to move her outside with our other goat, but you can tell a difference in the two. 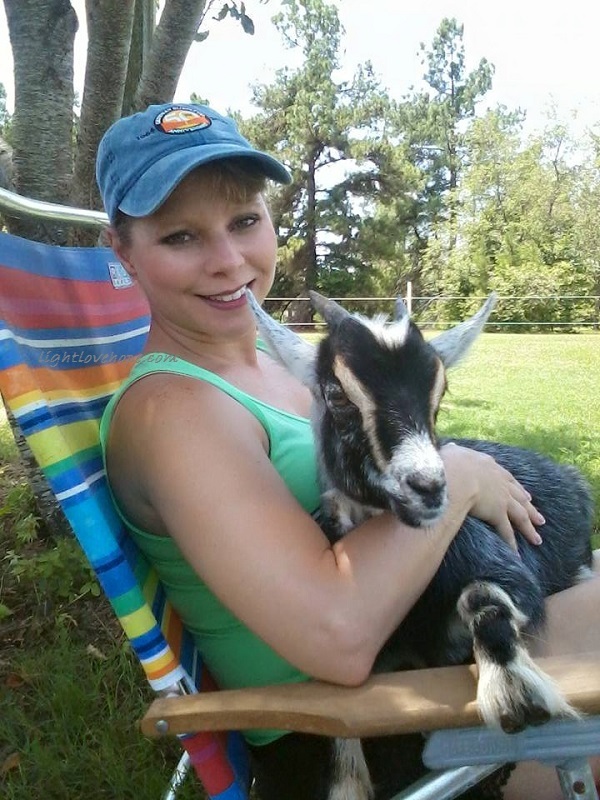 While Angel was handled as a baby as well, she doesn’t have the bond with us as our goat baby, Tory, has. Little Tory will come over to me and get in my lap, settle in, and let me hold her for long periods of time. She is so content being in my arms, and that brings me great joy. All of my animals bring me joy. Every single one. 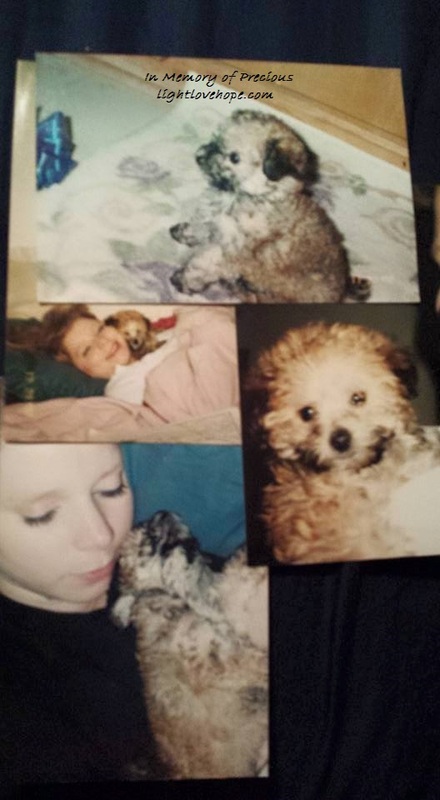 Precious, the little Toy Poodle that we had for 13 years, passed on July 9, 2015. Our hearts were broken, yet we knew the end was near. She hung in there as long as she possibly could, and we had quiet moments with her before her passing. I’ll never forget the weekend before she passed as I sat out on the hammock, and little Precious came hobbling alongside me, her back permanently arched from the arthritis that set in. I leaned down enough for her to climb into my lap, and she sat there with me for the longest time just letting me hold her next to me. As the days went by and her health declined, I wondered if that was her way of saying that the end was near and to just enjoy the moments we do have together, hold on to them and remember these good times we shared as it gets harder in the days to come after I’m gone. Oh I miss that little white cotton ball of a dog. Tears fill my eyes now as I think of her and the history as she was there during both of my children’s childhood. They had so much joy in their little hearts loving on this little puppy that looked like a teddy bear when we got her. There is still joy in our hearts when we relive the moments with her as we think of my oldest carrying Precious around like a baby and dressing her in frilly clothes, to my youngest daughter pushing Precious around in a baby stroller and taking her “grocery shopping” in her little grocery cart. Yes, these memories bring us joy, even on days when it’s hard and we are missing Precious so much. I still find joy in my heart thinking of this little four pound dog that had so much love for our entire family. Even my husband had a soft spot for this little dog. We got her just before we got married, and he was affected by her passing as well. 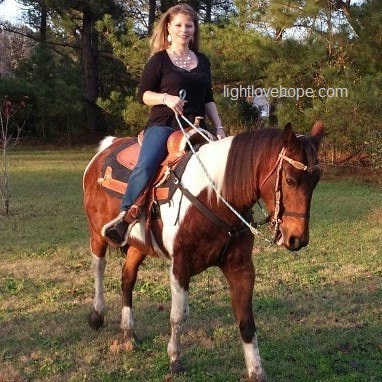 My horses – oh do I even need to say that they bring me joy? 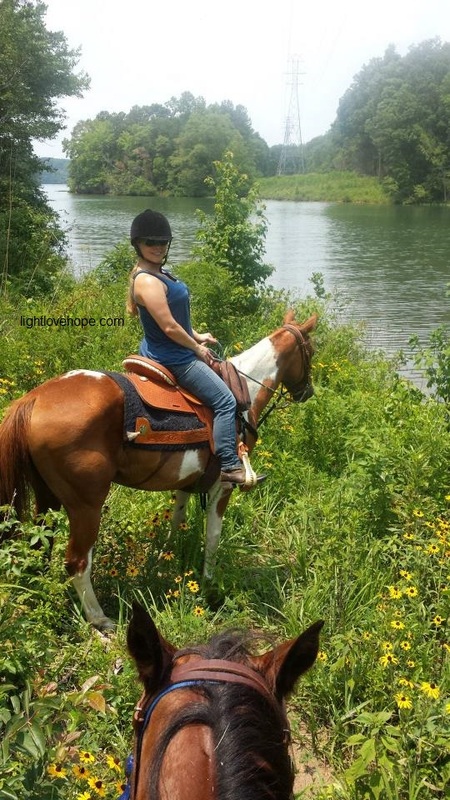 It is obvious by the many pictures I take on trail rides and the smile plastered across my face every time I speak of them to my family, friends, and coworkers. Even when I feel as if I don’t have anything to say that day, if someone asks about my horses, I can talk for hours on end just about them! Yes, I am that horse crazy and in love with them. They bring me joy from the hours we spend on their backs trail riding, to the quiet moments in the yard watching them graze, to the counseling sessions where they take my heartache and pain and replace it with nickers, neighs, and lots of horse love along the way. Time is marching on way too fast. Regrets? You don’t want to have any. So, take my advice and just DO it! Yes, you read that right. Take that family vacation that you’ve been putting off because you have bills to pay. Those bills do need to be a priority, but so does your family. I’m not saying take an extravagant trip that you can’t afford or that you’ll be paying off on your credit card for years. What I AM saying is just do it. MAKE time for your family. Take a day trip to the beach and watch your children run through the water at the edge of the sandy shore. Soak in all of their laughter as they splash and play. Allow your spirit to be free and soar right along with theirs. Enjoy the moment. Just DO it! Listen up, parents. I’m sure no one has to tell you that your children are growing up way too fast. At times when they are having trouble potty training or sleeping through the night, you may wish they were older and past that stage. Stop yourself if you can. Don’t wish their baby and toddler years away. Don’t rush them to grow up either. Before you know it, you will blink your eyes, and they will be walking down the aisle with a cap and gown on GRADUATING! Trust me. I KNOW! This just happened to me May 22, 2015 when my darling daughter was a newborn JUST the day before, and I blinked … and she walked across the stage in that royal blue cap and gown with the blue and white tassel hanging from her cap as she glowed – GLOWED, I want you to know – as we clapped and cheered for her great accomplishment. It … goes … way … too … fast! There is such an urgency I feel within my heart to tell you to do it NOW while you can. While your babies still want you around. When they want you to run in the yard acting like you’re fairies or better yet, like you’re in the Hunger Games. RUN … PLAY … SPEND PRECIOUS TIME WITH THEM! So they want to jump on your back, but you’re sooooo tired from the day’s work. LET THEM! Bend down and let them ride on your back across the yard. Hear their laughter in your ears, but let it flow right straight to your heart. Allow THAT to soak in, and you’ll see that a tired back is nothing compared to the memories you JUST made with your son or daughter. Years later when you look back on the pictures … relive the memories … or hear your children tell stories of their childhood to their own children … you’ll be so glad you took the time!